Eat, Drink, and Have a Really Good Time at Germanfest! Posted on May 18, 2013 at 10:00:00 am by Michelle M.
Germanfest is the unofficial kickoff of Fort Wayne’s summer festival season. The week long celebration is a celebration of Essen, Trinken, und Gemutlichkeit (“Eating, drinking, and having a really good time”!) 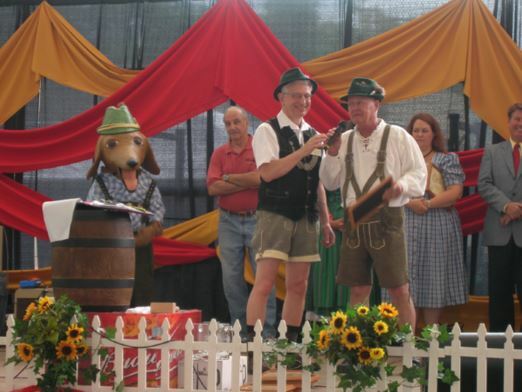 While Fort Wayne residents and visitors alike love to do all three, the festival also celebrates the German heritage many Fort Wayne residents share. Fort Wayne is often be referred to as “A Most German City” because of its strong German ancestry. The festival, which began in 1981, will take place June 2-9 at Headwaters Park in downtown Fort Wayne. Throughout the week several events will take place that you don’t want to miss. The Beer Stein Relay Race (you know you want to try it) gives you the opportunity to combine your love of running, friends, and beer on Friday night. Be sure to bring your camera and your sense of humor. Want to embrace your inner Lucy Ricardo? Then check out the Trauben Tromp (Grape Stomp) on Saturday June 9. Grab three friends and prepare to stomp over 300 pounds of grapes. After you’ve stomped all of those grapes, why not learn to polka? Patrick Didier and the American Styles Ballroom Dance Studio will be giving free lessons in the Germanfest Festival Pavilion. Traditional German bands will play throughout the week as well. Did we mention the food? Be sure to bring your appetite when you come to Germanfest. Traditional German food and beverages will be available for your enjoyment as well! Germanfest opens at 10:30 a.m. on Wednesday June 5 with admission of $2 from 2:00-5:00 and $5 admission after 5 p.m. Minors must be accompanied by parents. No one under 21 permitted after 9:30 p.m. Parking is available in the city lot next to Headwaters Park.